What do you fear more than God? It’s very possible that is what is causing you drama. For instance, I was recently stressed out because I didn’t want to disappoint someone and yet it was becoming impossible for me to meet their expected deadline. Yet did I really fear what that person thought of me more than I feared God who had my back and could clear my name? 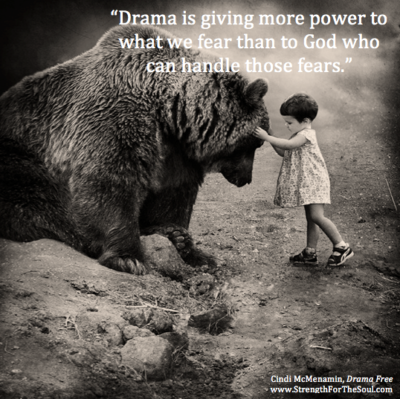 It occurred to me, as I was writing my book, Drama Free, that most of the drama we experience in life is a result of fearing people more than we fear God. (To fear God is to have a wholesome dread of ever displeasing the Lord. To fear people — and what they think about you or might do to you — is to give them more control over you than they deserve.) When we care more about what others think of us we are adopting a mindset where people are big and God is small. The Bible tells us “The fear of the Lord is the beginning of wisdom….” (Psalm 111:10, NASB). I find that verse interesting because I’ve come to realize the opposite of wisdom is drama. When we exercise wisdom, we use discretion and we don’t make a scene. When we demonstrate wisdom, we don’t bring distress to others. When we display wisdom, we are not putting ourselves on display. If fearing the Lord is the beginning of wisdom, which negates drama, then fearing anything other than God is likely to trigger drama. In Exodus 14:14 we are told: “The Lord will fight for you; you need only to be still.” (NIV). That is one capable God, able to do far more than our fears, worries or drama can accomplish. We can be full of drama, or full of trust in an all-capable God. I know which one I want to be. Don’t you? Let me know in the comment section below what you tend to fear more than God and I’ll enter you in a drawing for a free copy of my newest book, Drama Free. on When People are Big and God is Small. Thank you for this devotional today. My husband is struggling with some fears right now and this is such an encouragement, to be reminded that God is capable. What I tend to fear- which the LORD brought to my attention recently – is being alone without companionship, without friends, without someone to do life with. I am single in my 40’s without any children. My parents are still alive. Sometimes I wonder who I will matter to if they should pass away before me. I do have wonderful loving siblings, but they have their own families to look after. I am praying that God will watch over me. Thanks, Karen. I know those can be very real fears, but fears God is fully capable of replacing with His peace. Thank you for your heart to surrender it all to Him. I truly appreciated this wonderful blessing of a message, today. How powerful is God that I have this verse on my desk (Exodus 14:14) and that He would be fully aware of my fears. Today I fear economic insecurity as I’m a single Mom and recently lost my job. I am going through times of great anxiety over this, panicked feelings, and fear. Gratitude for this reminder today the He is in controls, hears my fears as I lean into Him. Bless you! I am responsible for producing my Church’s weekly bulletin & Order of Service. I get quite agitated when someone points out a typo I’ve made. I also get very uptight about playing the organ in church because I am too concerned about whether people notice when I play a false note. instead of focusing on the fact that I’m doing it for the Lord, and not for them. Oh how that spirit of perfectionism hits us all at times. Thanks for your honesty, Bettine. May He free your heart to serve Him with joy, regardless of the response of others. Thank you for your comment, Amy. I know how the fear of disappointing others can be stifling at times. Rejection from family and/or friends. Cindi, thank you so much. Everytime you speak about this, it just about brings me to tears. There is fear in my heart, I just don’t know what it’s about. Don’t know where it came from, what actually I’m afraid of, all I know is it is far bigger than me, and God is working at Being bigger than that which is causing my fear. When I was newly saved, God delivered me from a fear of heights. I hadn’t prayed about it, He just did it. I pray that for your daughter. I want my God to be bigger than anything else in my life. I am purchasing your book, I need it. Thank you for speaking about fears, as you have. I’m grateful. Thank you, Carol, for your sweet, encouraging reply. God is so faithful about taking all that we surrender to Him and giving us peace in return. HOW TIMELY! Your words are Exactly what was needed TODAY! I have been going through so much drama at work. As a Christian, I struggle with the lady that hates me. I struggle with the new boss that wants to replace me. I have been so fearful of getting fired, but now I am not. I wrestled with this for at least a week or more; I was afraid of not having enough to pay bills. I know God will help me no matter what is going on. I believe that God may be transitioning me to another place. I believe doors are going to open. I think they go together………..always being alone and never being really loved for myself!!!!!!!!!!!! So timely!! My mother sent me this and she was right – the message would be pertinent to a specific situation. It certainly is and I’m re-reading to let Gods truth sink in. Thank-you. I’m interested in your book either way!!! Thank you, Cindi, so much for your message! And thank you for your ministry – I have read 3 of your books so far, bought 4 more and planning on getting all of them eventually, because I found them to be very useful and encouraging! And this message about fears, oh, how appropriate it is for me! It is hard to confess but I fear to disappoint people… yes, I am a people-pleaser. My everyday struggle is to purposefully choose who matters most to me, God or people. and honestly, not always I make good choices… and your message made me thinking about and encouraged to read more about fear of God in the Bible, thank you! Your words are so inspiring and thought provoking. I am on Ch 3 of Drama Free and it is one of those books that you just can’t put down. I look forward to ordering some of your other books as you are truly gifted in spreading the gospel. Thank you! I fear losing different aspects of my health. I’ve already lost some, and may be losing more. Thanks, Cindi. I’d love to get your book through the drawing. Thanks, Bonnie, for taking the time to comment. I fear that people will think I am inadequate or not capable, and that tends to make me very agitated. Sometimes I think that fear paralyses me more than helps me. Thanks for your input, Tia. I think we all can relate. Thank you Cindi for your inspirational and encouraging message. I am in one those moments in life that I don’t know what to do with my life, or where to be. I am 58 years old. I have a daughter,we live together and who always fights with me and she never appreciate what I did for her or what actually I’m doing for her. I’m supporting her and her baby, my granddaughter. I’m the only one working and I’m always fear to leave her alone and she has to take care of herself and her daughter. So one day she will appreciate me. I’m newly married and I’m scared I might not be happy… Already I see signs of my husband being strict and uptight, that is mighty scary, I’m scared I might let someone else feel the void and I won’t love my husband like i’m supposed to. Tomi: Thank you for sharing what you fear. My book, Letting God Meet Your Emotional Needs, would help you with where you are right now because it helps a woman find Christ as her first love. Only Christ Jesus can fill the void in our lives, and keep us from looking to our husbands or anyone else to fill us completely. 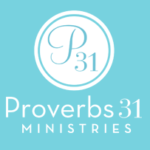 I also have some free articles on my Articles of Encouragement page to help you look to God, not your husband, to fill you completely. Thanks for sharing. I was once there, myself. Thanks so much for this piece. It’s really a blessing to me. Am praying God should help me to surrender all my fears of the unknown to Him. I want to trust Him completely. Your blog is indeed a blessing. Prayer led me to your site today on a google search for how to parent 2 daughters going through a turbulent time during which I seem to be their ‘whipping’ post – I fear having failed them during an abusive marriage and now a separation fraught with toxicity. Janet: I’m glad you found my site. I have some free articles under “Articles of Encouragement” that will encourage you when it comes to maintaining a healthy relationship with your daughters. You might also want to check out my books, When a Mom Inspires Her Daughter, and 10 Secrets to Becoming a Worry-Free Mom. In the latter, I write about God’s ability to “filter the garbage” and also “fill in the gaps” when it comes to our parenting and the situations our children have been through and I know that would be encouraging to you right now. Blessings.